You’ve all done great work in 2016 and now, with the year coming to a close, we want to recognize the 30 senior photographers to watch in 2017! 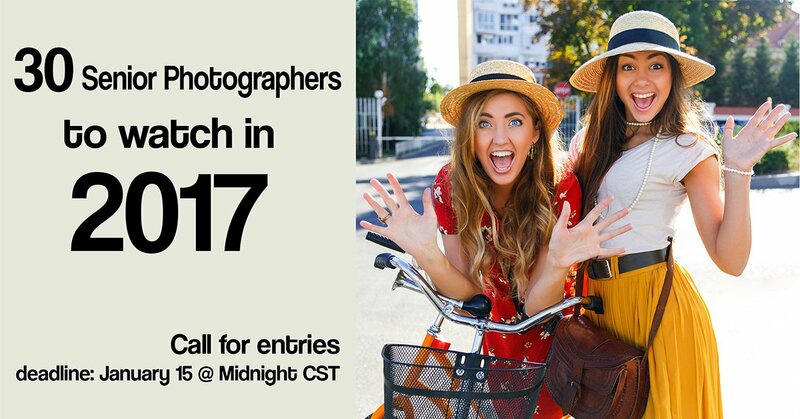 SeniorInspire is excited to announce our first annual contest for Senior Photographers to Watch in the Coming Year! We’ll be accepting contest entries through January 15th and announcing the winners in an Instagram slow reveal all day on January 22nd! We’ll also be featuring the winning images on our Facebook page as well as our website with links back to your own website. Please carefully read through the rules below before submitting. The contest will run thru Midnight, CST on January 15th. Winners will be featured all day on the SeniorInspire page on January 22nd. You may submit as many images as you’d like. If you want to submit more than 5, do it on a second form. * All image files must be submitted using the form below. * Images should be sized at 1200px on the long edge. * Images from paying clients only. No workshop images. * Include your studio name in the filename of each file submitted. * You must certify that you have a signed release on file for each image submitted. * You may enter as many images as you’d like. * All images must be of high school seniors who are either 2016 or 2017 graduates. * All images that do not meet the submission criteria will be disqualified. * No refunds will be given for disqualified images. * All contest decisions made by SeniorInspire will be final. * As you’d expect we are looking for your best work! We want gorgeous images with impact and beautiful light that show creativity, excellent composition and great posing. Send your very best! If you have any questions feel free to click here to email. The deadline has passed. Thank you to everyone who entered! The winners will be announced in an Instagram slow reveal all day on Sunday, January 22nd. Good luck! I submitted some pictures because my photographer was so awesome that I feel she needs to recognized. However, I may have accidentally but my name I a place where hers should have gone. I first thought I was filling out a referral and submitted it only to realize it all should have been about her. Also, I may have submitted incorrectly. Oh well- Best of luck! Hello! I submitted 5 pictures a few minutes ago, and I failed to realize that the files did not have my studio name on them before sending. Does that disqualify me, or do I need to resend them? Just sent an email your way regarding my last minute submission. I got it in under the wire but had a hiccup with the export sequence not properly naming the files that didn’t catch my attention after submission. I am from the U.S., but have moved to New Zealand where I am the first high school senior photographer here! Am I able to apply for this contest even though I am out of the country?